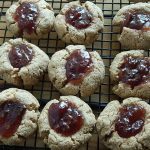 Peanut butter and jelly is definitely a staple at our house and not just for the kids. We will eat peanut butter almost any way we can get it, but it is amazing with sweet jelly. I think these cookies are my new favorite way to eat it now. Plus they are a healthy treat, which is always a bonus. 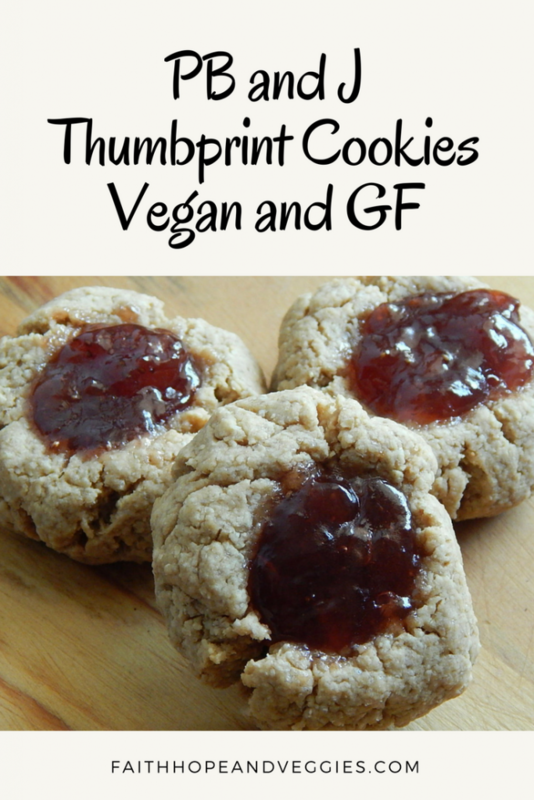 I used oat flour for the cookies to keep them gluten free. I make my own by grinding rolled oats in the food processor until it is the texture of flour. Since these are mostly made with oatmeal my daughter tried to convince me that these cookies would be a good breakfast. 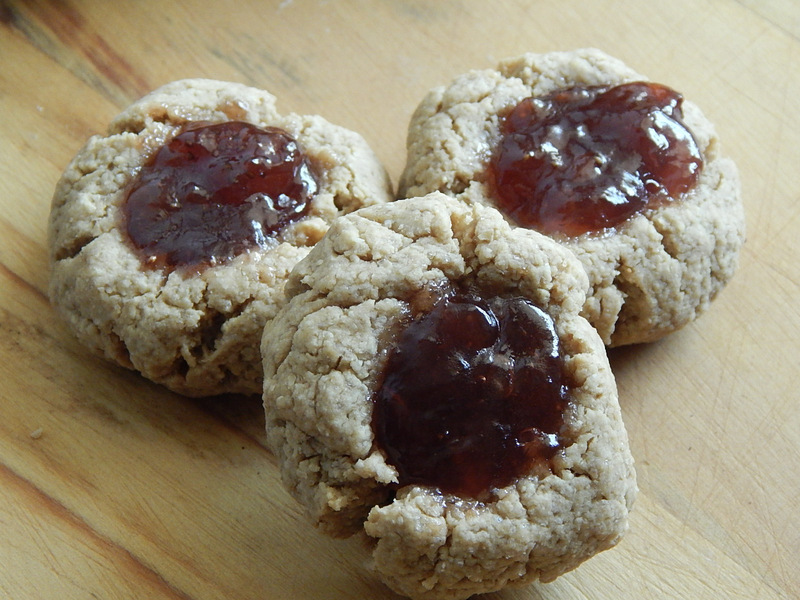 For this batch I used strawberry jam, but you can use whatever flavor is your favorite. I also use natural peanut butter that is unsweetened. If you use sweetened peanut butter than you may want to cut back on the sugar in the recipe. In a large bowl combine the oat flour, peanut butter, apple sauce, sugar, baking powder and salt. Stir until everything is well combined and it has formed a stiff dough. (I use my hands to mix it). If it feels dry add in more applesauce a little at a time. When the dough is combined scoop out a heaping tablespoon full and roll it into a ball. Set it on the baking sheet. Repeat until all of the dough has been used. Space them out a few inches apart. 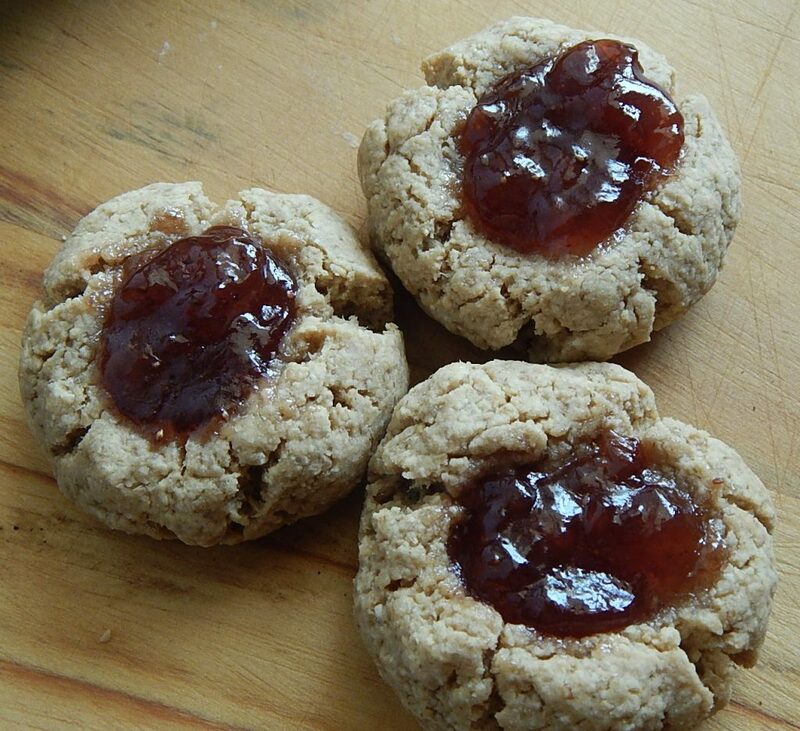 Press your thumb into the center of each ball of dough about half way through to make a hole for the jelly. Fill each hole with a little jelly (about a 1/4 tsp). Bake for about 18 minutes. Let the cookies cool on the pan for a few minutes until moving them to a cooling rack.